Not many people outside Japan are familiar with the Dragon Slayer series. Created by Nihon Falcom, the great minds behind Ys, the first game enjoyed a good deal of popularity and got many sequels, though unfortunately, almost all of them remained exclusive to Japan. The second Dragon Slayer game, Xanadu, actually branched off into a seperate series of its own and also got a bunch of sequels, but again, almost all of them were exclusive to Japan. One of the very few that wasn't was a spin-off for the NES, produced by Hudson Soft rather than Nihon Falcom, omitting the series' overhead aspect to feature exclusively side-scrolling gameplay. 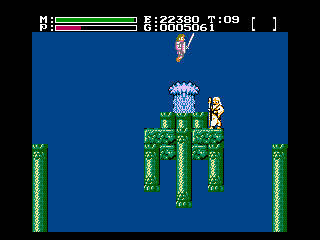 In Faxanadu, you play a nameless hero who has just returned to his hometown after an epic adventure. Located at the base of the enormous World Tree, the townsfolk immediately tell you that the land has been in a pretty dire state since you left. Although the Elves and Dwarves that inhabited the World Tree lived in harmony before, an evil being from another planet known only as the Evil One arrived one day and corrupted the Dwarves, transforming them into monsters and setting them up against the Elves. Since then, all of the tree's water springs have dried up and all of the towns on the tree's branches have been on the verge of being overrun. Of course, you are tasked not just with defeating the Evil One, but also reactivating all springs and restoring life to the tree. Setting off from your hometown Eolis, you've got to climb all the way up the tree, going through many dungeons and enemy-inhabited places to eventually reach the Evil One's stronghold and give him what-for. The game plays pretty much exactly like the sidescrolling action sections in Zelda II: you don't just have to worry about defeating enemies with your weapons and magic, you also have to carefully cross gaps, find keys and recover important items. The game adds a little bit of extra depth in that you can buy better equipment as you reach new towns, and it's highly suggested you do so, as each new weapon, spell, set of armour and shield is twice as effective as the last one. An interesting point is that there is no real leveling up to speak of, instead the only thing that influences the damage you take and deal is your equipment. There are experience points, and you will gain "titles" as you reach certain amounts, but the only thing they actually do is increase the amount of money you start with after a death. 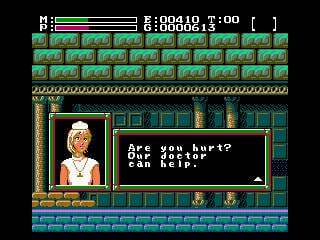 Unlike Zelda II, that at times could be frustratingly hard to figure out what you were supposed to do, Faxanadu's townfolk are surprisingly helpful: they will tell you pretty much exactly where to go and what to do, and, for the most part, don't speak in broken English. The game is mostly a fairly straightforward romp to the top of the tree, but you will have to enter several dungeons to reactivate springs or collect special items to open the path forward. Faxanadu is also a bit more forgiving than Nintendo's effort in that you can buy potions and elixirs which you can use at any time to recover health or automatically save your life should you happen to run out of health. You can also purchase wing boots that let you fly for a generous amount of time, and keys that open the entrances to most dungeons. The game never really reaches insurmountable levels of difficulty, but any troublesome part can easily be overcome by using some of these items. It's a surprisingly long game, and it can easily take first-timers upward of 5-6 hours to finally lay waste to the Evil One's plans. None of those 5-6 hours ever feel like a slog, though; it's a surprisingly fun game that perfectly manages to strike the balance between being too easy and being too hard. If you're not too good at it, you can always spend a small amount of time fighting monsters for money to purchase items to help you, whereas if you are good you can cleverly outfight any opponent in your way. One major complaint when the game was new was its password system. Although the original Japanese release allowed the use of saves, in the Western version you had to visit a church to receive a lengthy password that then had to be entered the next time you booted up the game to continue where you left off. If you messed up writing down one letter, you could wave goodbye to your progress. Thankfully, the Virtual Console's suspend feature completely eliminates this issue. 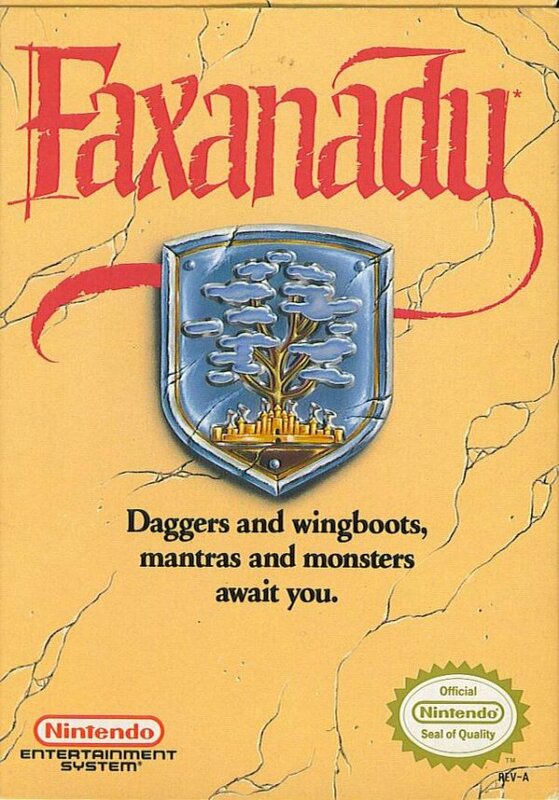 Faxanadu is a bit of an oddball in the graphics department. If you just glance over some screenshots, it seems very dull and gritty, but if you take a careful look in the backgrounds of many of the game's locations, you'll find that they are actually intricately detailed and perfectly portray the fact that you spend most of the game walking on a giant tree that's slowly dying. The music is similarly atmospheric, with initially upbeat tunes that grow increasingly more creepy the higher you climb up the tree. 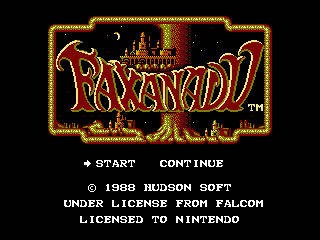 Faxanadu has long been on people's wishlists for Virtual Console releases, and for many very good reasons. It's basically Zelda II without any of the flaws, and should be an absolutely essential purchase for anyone who likes either platformers, action games or RPGs. This was a very cool game. I remember buying it on a whim one weekend and loving it. Very unique game indeed. There was definitely more that one ERROR in the townspeople in Zelda! I'll have to give this a try. Looks fun. I love it. But I need The Battle of Olympus too. Aw, I'm disappointed. I was hoping for at least a 9, but I'd give it a 10. This and The Guardian Legend are the best games on the NES imo. Also this game was published by Hudson Soft/Nintendo, developed by Hudson Soft, and Licensed by Nihom Falcom. I actually expected the review to be lower. It didn't look like much to me. It does seem more interesting now. I may just get this anyway. If it's basically Zelda 2 without the flaws it must be pretty good. I'm always eager to try out nes games I missed. The box art looks a bit like Zelda, but otherwise, this game craps all over Zelda II. There are no overworld treks (no getting lost), but there's still a bit of backtracking (after you fight the first boss, for example), but otherwise, it's not too easy to get lost. Further in, you have to worry about buying boots and keys, and if you come to a point where you need an important piece of equipment like flying boots (and you didn't buy them), back you go. But at least you get the opportunity to raise gold and buy that early "death" spell (4000g, if I recall). I thought I was familiar with the game (we used to own it on the NES), but your mention of restoring the fountains brought back memories of the bosses, which were quite tricky with the wrong equipment. Of course, I have always remembered the difficult password system (me and my siblings used to write the letters in lower case, and write a line above or below to denote what case they were in the password), the grinding to get the best equipment, and the many NPCs who couldn't stop blinking, as their eye animations were tied to their mouth animations. My brother used to call those bouncing enemies in the first area Boobie/Booby Monsters. I'd definitely buy this when I get the chance. Aways buy a load of keys before leaving any town. Otherwise the game will get really frustrating. I have the manual for this game. 1 of the few NES games booklets that you need to read over&over, tons of carters,enameas, items & power ups. -Second only to Zelda. Awesome games: an action/RPG Play It! 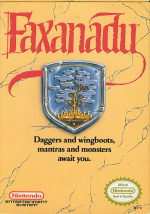 Good to see a fair review of Faxanadu. Here in Sweden the main gaming magazine keeps complaining about the difficulty, but really this game is a decent challenge. You could have mentioned the somewhat stiff controls in the review, glad you liked the graphics though! I love the fog effect. I might pick this up at some point. I really like Zelda II's concept, but the game is just too hard for me. This was one of my favorite NES games as a kid. I think 8/10 is fair, because this game isn't perfect. You can't duck, and the jumping can be awkward. So, I prefer the controls and combat in Zelda II. 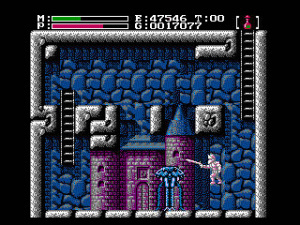 But Faxanadu has some unique things to offer. With its gritty look (reminds me of Genesis and TG16) and scary areas, overall this game feels more "grown up" than Zelda II. If you're a fan of platformers, it's definitely worth 500 points. This sounds like a pretty fun game, might have to give it a shot. 8/10 Very very good !! I wasn't sure what to think of this game when I first played it. The controls were kinda stiff and I had no clue where I was suppose to go. But it seems like the game gets alot better if you commit to it. So I'll deffinitely consider downloading this once it hits the NA VC. "you spend most of the game walking on a giant tree that's slowly dying. The music is similarly atmospheric, with initially upbeat tunes that grow increasingly more creepy the higher you climb up the tree." and since i watched this whole game on youtube, id tell anyone you will miss out if you dont add this to the VC collection! It seems like a very intresting game! I would'nt buy it though cause I don't like those old Zelda like games. But anyways very very intresting. Why does this game use passwords if the older Japanese version actually saved? @uel: The Japanese version probably released on the Famicom Disc System. The same thing happened when they released Metroid and Kid Icarus in America...man, would a proper save feature have been good in both of those as well! Either that, or they were being cheapo jerks with the Western release of this title, I don't know for sure. Anyway, this game is definitely on my radar, and I expect I'll make a point to download it on release day in America...whenever the heck that is. Judging from the review, it sounds like Faxanadu is a tad longer than Ys III: Wanderers from Ys for the SNES. I believe the Japanese release was a regular Famicom title, so I have no idea why they pulled the save feature. Perhaps to save on cartridge costs? They also removed the ability to give your character a name, and some crosses on and inside the churches. I may pick this up if I clear the backlog of games I have that need playing. Love Faxanadu but it isn't a long game. I've beaten it it one sitting a couple of times. It's definitely short for an RPG but it's quality all the way through. If you are a first time player though it may last a bit longer. I've beat the game a handful of times since I was about 8 years old. @Drake: Well, I guess my "cheapo jerks" comment applies. Except for the removed crosses, of course. That gets filed under "overzealous censorship jerks." @JebbyDeringer: Sounds like it could be a relatively long sitting, though. I've beaten StarTropics in one sitting...it was a five-hour sitting, though. Most people aren't going to have the stamina/willpower to push through like that. One of my all time favorite games. If you are on the fence about this one, just go for it. If for whatever reason you don't like it (which I can not think of a good reason to not like this game) you will only be out 5 bucks. The box looks cool. Sadly this is just a download. Wish i could have the game as an original. I remembered this game back in the day when I was a kid but never had the chance to play it. Then when I finally got my chance, someone borrow the game and I haven't gotten it back. I CANNOT wait for this to come to VC... I have unfinished business. @FaxanaduGuy - I've commented on your Faxanadu II page (I have a deviantART account, too, under StarBoy91). Good job. @ 38. RightHemisphereG While I'm at it, might as well throw in one more unfinished business game coming to VC: Arcade Ghost N' Goblins (the one that hooked me and drew my soul into the 10th lv. of Hades but have only beaten the NES version). @ Stuffgamer1 Ah StarTropics... the name alone is music to my ears. I remember the first time that I found out this game was originally part of the same series as Legacy of the Wizard (Dragon Slayer IV) in Japan it shocked me. Speaking of which, we definitely need Legacy of the Wizard on the VC sometime too. That was a great game. Ahh! I can't wait! When is this being released in the U.S.? Stop comparing this to Zelda 2, it's immaturely offensive. Looking forward to playing through this again. Always remembered it a favorite, but I think I only played through it once back when it was released. @Banana_Jane: Although Faxanadu was actually released before Zelda II I think the comparison is completely valid, aside from the lack of an overhead overworld, the games are similar enough to be comparable. Plus, everybody knows what Zelda II is like, so that can be used to explain what this game is like more easily. Loved this game back in the day, and still do. I will be coughing up $5 very soon. One of my favorite NES games. I love this one. An 8 is an apt score. I'd describe it more as early metroidvania, but a bit more linear, and no map. I noticed right away that they corrected one major flaw: Mantras are now easier! Yeah, they're still long, but they no longer use the decorative font (the one in the menus). The Wii release uses the NPC font for passwords, which is much clearer. No more guessing to fix a wrong password "Was it an H or an N? A c or an e? B or E? O or 0?". Wha...!? How was Zelda 2 harder than Faxanadu?! ?